Agent 8, also referred to as Number 10,008, is a playable Octoling and is the protagonist of Splatoon 2's Octo Expansion. Female Agent 8 seen in the Octo Expansion trailer. 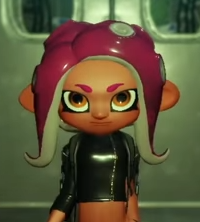 Depending on the player's choices, Agent 8 can have different eye and skin colors, as well as being either male or female. The female’s default hairstyle features two thin tentacles, parted at the front, reaching slightly past her shoulders, and two larger but shorter tentacles in the back. Alternatively, they can have two tentacles tied at the back in a ponytail with two small tentacles as sideburns. The male’s default hairstyle features a mostly shaved cut with one main tentacle Mohawk down the center and three small tentacles lined up at the back. Alternatively, they can have an afro, reminiscent of an Octopus' mantle. They all have white underneath their tentacles and ring-like spots at the ends of their tentacles. Their outfit consists of a black leather crop top for females or a slightly longer shirt for males with one long sleeve, leather skirt for females or pants for males and boots, and a type of neon yellow wristband on both their ankles and wrists. If they pick up armor, their shirt now has two sleeves that reach down to their wrists. When they are damaged, their sleeve will fall off and reveal a padded undershirt. Despite being mute throughout the game, Agent 8 shows aspects of their personality through subtle means. Agent 8 has a fondness for poetry and writes one for every mem cake collected. Throughout these poems, Agent 8 demonstrates a yearning for life on the surface, participating in Turf Wars, finding a part-time job, and dressing up in fresh clothes. This resolve is shown most strongly in the final area of the Octo Expansion, where failing repeatedly activates a Skip Charge, showing Agent 8 with glowing eyes as they charge through the stage with the Calamari Inkantation motivating them. Despite this, Agent 8 also wishes to apologize to DJ Octavio for unceremoniously deserting the army in pursuit of Inkopolis, as well as recollecting their old Octarian friends, specifically an Octoling whom Agent 8 fondly remembers, and hoping that they do not think badly of their decision. As a result of listening to the Calamari Inkantation, Agent 8 is a big fan of the Squid Sisters, anxiously planning their greeting to the pair upon reaching the surface every night. Agent 8 appears to have known about Marina’s escape to the surface and was glad to hear that she had made it safely. Agent 8 was also seen to be somewhat confused by Cap'n Cuttlefish's actions and personality, as seen from near the end when they awkwardly glanced at Cuttlefish when he was rapping with Pearl, and when he happily accepted being the "hype man" in the battle against Tartar. Agent 8, being an Octoling, is apparently disgusted and quite offended at how many squid-themed objects there are in Inkopolis such as Squid Bumpers, and asks people to consider how Octolings see the world. They are said to love the sea breeze and will go to the shore to feel it regardless of the fact that they cannot swim. Agent 8 has shown a fondness for both Flow and Craymond. Interestingly, they are also said to enjoy listening to Sheldon rambling, in contrast to various other characters, possibly due to Octarian culture centering around technology and weaponry. Agent 8 was an Octoling soldier for the Octarian army and had a change of heart when the Calamari Inkantation was etched onto their soul. In Octo Valley, Agent 8 encountered Cap'n Cuttlefish and Agent 3, where Cuttlefish had them attack Agent 8. The two battled until all three of them were attacked by someone and were knocked into the Deepsea Metro. Agent 8 lost their memories from injuries suffered during the fall through the ceiling and became a test subject of the Metro. According to Marina, Octolings that hear the song become discontent with Octarian society and choose to strike out on their own. They are called Agent 8 by Cap'n Cuttlefish in reference to them being identified as subject number 10,008 in the testing facility since Agent 8 forgot their real name after losing their memory. Agent 8's role is to complete various missions in the Deepsea Metro with the premise of reaching the promised land by finding and collecting the thangs. The reasons for these missions are not yet known, other than its purpose is for selecting out the best test subjects, where those who succeed in assembling the thangs get their DNA added to the green sludge, as revealed by Commander Tartar. The missions take place in an area that is supposedly a testing lab, with a variety of objectives. After Agent 8 collects all the thangs and almost gets blended by them, the objective changes to escape the facility to the surface by their own means after Agent 3 manages to reveal a new path. There is a set of different Phases that Agent 8 has to navigate through, each with their own objectives. When Agent 8 reaches the surface they have to fight Commander Tartar and the NILS statue to defend Inkopolis from being destroyed. Agent 8 appears in Chapter 24 of the Splatoon manga as an Octoling boy with red eyes and the Mohawk hairstyle, and wears a pair of Squidlife Headphones, Null Boots Replicas, and unique pants and top, and wields a Blaster. He found Goggles, who had previously attempted to land on the Grizzco boat when Super Jumping back and ended up sinking into the water. Agent 8 is shown to have a hand in machinery, like Octolings are said to, and made Goggles a new set of gear for him, a Splattershot and the same ink tank that he has. Due to forgetting his name, Cap'n Cuttlefish refers to him as Agent 8 and Goggles refers to him as Hachi (Japanese for 8). A female Octoling named Nana (Japanese for 7), wearing the full outfit Agent 8 wears in the game, also appears initially from Hachi's flashbacks, and is not seen physically until Chapter 26. Two other Octolings, Afro and Pony (nicknamed after their hairstyles) appear in Chapter 28 after the NILS Statue is destroyed and are also wearing the full outfit Agent 8 wears in the game. They are all set to be Hachi's teammates where they all partake in Turf Wars after reaching Inkopolis. As Hachi and Nana wear the clothes that Agent 8 in the game wears, but without the yellow tags on their wrist and ankle, in the flashbacks taking place before they were taken to the Kamabo Co. facility, it is possible that the clothes Agent 8 wears is what younger Octolings wear. Afro and Pony also seem to be lacking the yellow tags when they were rescued. The Splatoon Ikasu Kids 4-Koma Fest also features Agent 8 in CoroCoro's separate August 2018 issue, appearing as an Octoling boy with orange eyes and the mohawk hairstyle. Agent 8 was first revealed as a character on 8 March 2018, along with the rest of the Octo Expansion. Agent 8 notably looks very different from the Octolings seen in the Hero Modes for Splatoon and Splatoon 2, having rather unique features. Their rounded ears could be based on the dumbo octopus, a deep sea creature which relates to the theme of the deep sea in the Octo Expansion. Their left ear is more indented than their right ear, referencing the octopus' siphon that lies on one side. They are the first playable character to use dialogue, such as "Your guess is as good as mine" when viewing a Hazy Memory. Their name could possibly be a reference to the number of limbs an octopus has. The Spawn Point lights in the Deepsea Metro have an 8 as their design, referencing Agent 8. Agent 8 is the only agent to not wield the Hero Weapons and instead wield different sets of standard main and sub-weapons. They are the first player to have a fixed first-person camera view so the player can select their gender, skin, eyes, and hair. They are the first playable character to wield the Octoshot as well as be unarmed in certain levels. Unlike Agent 3 and Agent 4, Agent 8 is the only playable character to not have a weapon in the hub world, though they still have an ink tank on. The character customization screen for the Octo Expansion shows what appears to be the male and female forms of Agent 8 being sanitized. It is unknown if Agent 8's outfit was what they wore when they were part of the Octarian army or was when they fell into the Deepsea Metro given the tags on their wrist and ankle. After escaping the Deepsea Metro, if Agent 8 watches Off the Hook with the zoomed in view, they will respond differently, showing that Pearl and Marina recognize them. Apparently, when Agent 8 was in Octarian society, they felt heartbroken at the fact that their superiors were kidnapping the Zapfish and had to refrain from saving them themselves, as shown in the eighth mem cake of the Line I series, implying that Agent 8 was possibly more compassionate than other Octolings to start off with. In a Splatoon 2 anniversary Famitsu interview with the developers, it was revealed that Agent 8 dies and does not respawn if they get splatted during the escape Phases. It is further explained that during multiplayer battles and the test stations, Agent 8 gets resurrected at the respawn points, but failing during the escape and choosing to continue playing just has the player "go back in time" to when Agent 8 still was alive. Furthermore, in the game, the checkpoints that Agent 8 encounters during the escape are flashing red, which is the same animation the checkpoints have in the tests when the player is down to their last respawn. However, there is an exception during the Spinal Phase, as the checkpoints there show the normal animation. The reason for this is unknown. If Agent 8 gets splatted during the escape, characters will shout their name in a worried fashion. When the player chooses to continue, the respawn animation (where the "ghost" comes back to form the body) does not play, instead cutting back to Agent 8 already standing. When Agent 8's Skip Charge fills up to 100% during the Escape phases, the beginning section of Calamari Inkantation plays. Female Agent 8's primary design has varied somewhat, appearing with grey eyes in the key art, promotional art, release art, download card, and Twitter celebration art and with orange eyes in the trailer, amiibo, and website renders. Agent 8 is also nicknamed "Eight" by Off the Hook. Agent 8’s male and female forms. Agent 8 in their octopus form. Agent 8's Octopus Artwork used for the Amiibo box. Female Agent 8 as she appears in the poster. Agent 8 seen with a charger. An unconscious Agent 8 at the start of the DLC. Both forms of Agent 8 floating in green liquid, as seen in the DLC trailer. Agent 8 outside of the facility. Agent 8 Fighting Sanitized Octocopters using the Heavy Splatling. Agent 8 Fighting Sanitized Octozeppelins using the Inkjet. Promotional image of Agent 8 as a girl and a boy. Agent 8 inside a mission. Agent 8 standing in front of a mission entrance gate. Agent 8 on a ride rail, wielding Dualie Squelchers. Ink Switches can be seen in the background. Agent 8 being thrown at the checkpoint at the start of Girl Power Station. Agent 8 inside a mission. The objects floating in the background are Nintendo GameCubes with their controllers and discs. Agent 8 breaking some target crates with an Octobrush. An octo-machine resembling a cross between an Ink Piston and a Flooder can be seen on the left. A promo for Octotune, with Agent 8 on Disc 1. Marina's drawing of Agent 8 before the Turf War mission reflects their gender and hairstyle. SplatNet 2 wallpaper reward of female Agent 8. SplatNet 2 wallpaper reward of male Agent 8. Inktober art of Agent 8 celebrating the International Octopus day on 8 October 2018. The character customization screen that the player can choose to determine which gender Agent 8 will be. Female Agent 8's eye color being chosen. This page was last edited on 23 April 2019, at 07:23.